It’s Spring cleaning time again. Would you like to get your house spotless without all the chemicals? Here are some all-natural tips and tricks for common household problems. Vodka is good for much more than mixed drinks. If you have water spots and soap dulling the chrome on your faucets, a wipe down with some vodka on a soft cloth should shine them up in no time. Mold and mildew spots on your caulk or tile? Spray them with vodka, let sit for up to 30 minutes and them give them a good scrubbing and a rinse. If you want to preserve you fresh, Spring flowers inside, add a few drops of vodka and a teaspoon of sugar to the water and you can keep them for longer. Got milk? Get your chores done! Do you have a piece of china with a hairline crack? Don’t give up. Place it in a pan, covered with milk and then simmer it on low for 1 hour. Allow the milk to cool, then remove your china and give it a good rinsing. The proteins in the milk should bond the finish back together! Did your milk go sour? Good! Now you have a perfect, eco-friendly silver polish! (If it didn’t go sour on its own, just add a little vinegar.) Let your silverware soak in a milk bath for half an hour, then wash it off in warm soapy water and give it a good buffing with a cloth. The buzz on coffee is that it’s more than a delicious drink. Have you cleaned your fridge, but it’s still not smelling as fresh as you’d like? Put some fresh coffee grounds in a dish and then leave them in your refrigerator for a couple of days. Odors will disappear and the fridge will smell like delicious, fresh coffee in the meantime. This trick also works for the trash! If the garbage is gone but the smell isn’t, sprinkle some fresh grounds in the can between trash days. You can also add some to every new trash bag for a freshness boost! White vinegar is one of the most versatile things in your pantry. Here’s a vinegar tip you might not have seen yet. It can be difficult to get the inside of your microwave all the way clean. Give yourself a break and give it a good steaming. All you need is a dish with a 50/50 mix of vinegar and water. Microwave it to a boil and let the microwave get good and steamy inside. Now it should be easy to wipe everything down. Did you decide to re-arrange the furniture as the finale to your Spring cleaning and now there are annoying dents from the furniture showing in your carpet? I have 2 easy solutions for you. Leave an ice cube on the dent and it will gradually plump the carpet up as it melts. If this is an area rug, you may want to put a towel underneath to protect the floor. Another approach is laying a cloth over the dent and then steaming it with your iron. Either way, your dents should disappear like magic! 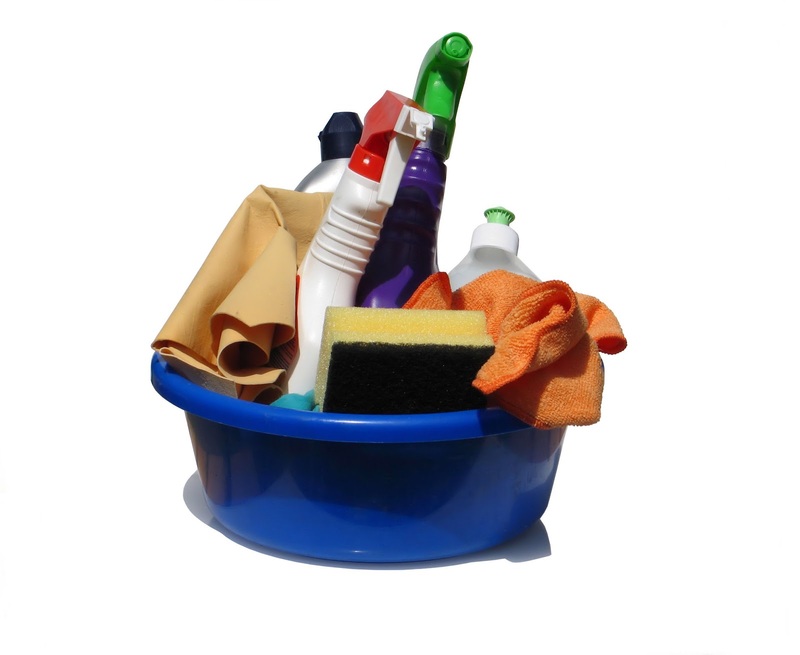 Are you ready to clean the bathroom, but you’re out of toilet cleaner? No problem. Just mix together 1/2 Cup of Borax and 1 Cup of Lemon Juice for eco-friendly and lemony fresh cleaner. Rust stains and lime build up will go away if you let it sit for a little bit. This flour tip takes the cake. If you want your stainless countertops and sink as bright as brand new, dry them after a good cleaning and then sprinkle on flour. Buff them with a cloth and the flour will polish them without any chemicals.